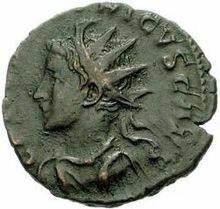 Antoninianus of Tetricus. Caption: C. PIV. ESV. TETRICUS CAES. ^ According to König (I. König, Die gallischen Usurpatoren von Postumus bis Tetricus, München 1981, p. 158ff. ), the elevation to Caesar is to be placed in 271 or 272. Drinkwater (J. F. Drinkwater, The Gallic Empire. Separatism and Continuity in the North-Western Provinces of the Roman Empire A.D. 260-274, Stuttgart, 1987) has provided good reasons to support 273 as year of elevation. ^ Aurelius Victor, Liber de Caesaribus, 35.5. This page was last edited on 25 March 2019, at 12:14 (UTC).